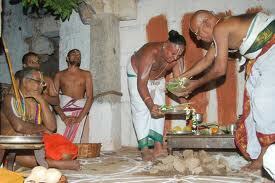 Brahmotsavam is Mostly Celebrated in Month of Sapetember and October Month in Tirupati Andhra Pradesh. 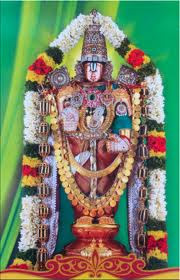 Tirumala Brahmotsavam is a Hindu festival celebrated annually at Tirumala Venkateswara Temple at Tirupati in Andhra Pradesh. The festival continues for 9 days in the months of September and October. It is believed that Lord Brahma was the first to start this festival. 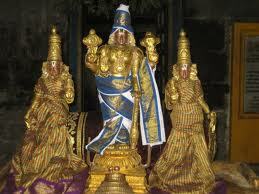 He worshiped Sri Balaji on the banks of the Pushkarini in Tirupati to thank him for the protection of mankind. 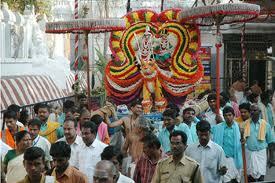 Hence the festival bears his name ‘Brahmotsavam’ which means Brahma’s Utsav. According to Hindu mythology the history behind this Festival traces to Lord Brahma (Creator of universe). 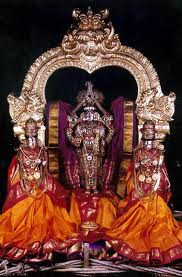 It is believed that Lord Brahma worshipped Sri Balaji on the banks of the holy Pushkarini in Tirupati. Lord Brahma wanted to thank Sri Balaji for Balaji’s protection of mankind. 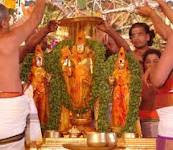 Every year millions of devotees gather at the temple of Lord Venkateshwara at Tirumala to take part in the festivities. It gives all devotees an opportunity to receive the blessings of Sri Venkateswara Swami and experience “Vaikuntha Anubhava” or heavenly enjoyment and feeling. 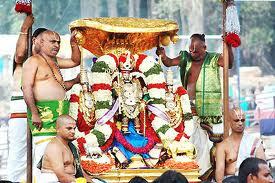 The idol of Lord Venkateshwara is taken out for processions on different vehicles on different days. The black idol of Lord Balaji is decorated with gold ornaments and precious stones to make the procession more attracting. The festival attracts pilgrims from all parts of the country and even from abroad. On the first day of the festivities or Dhwajarohana, the flag is hoisted near the Srivari Alaya Dhwajasthambham. The flag has an emblem of a black Garuda. It is on this day that a marvelous procession of Lord Venkateshwara on Pedda Seshavahana is taken around the four streets of the main temple at ten in the night and continues till midnight. 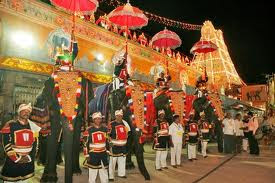 The Lord is taken on a vehicle called Seshavahana during the first two days of the festival. In the morning of the second day, the Lord is taken out on the Chinna Seshavahana while in the night the deities are taken to Uyala Mandapam for the Unjal Seva. This is then followed by a procession on the Hamsavahana. Hamsa or swan which symbolizes purity is said to have the capability of distinguishing between the good and the bad. The day is called Simvahana symbolizing strength and power. Simha means lion and according to Gita the Lord is the simha of all animals. On the third day, the Lord is therefore carried on Simvahana. In the night, the deities are carried on Mutayalapandiri Vahana which has a pearl covering, a symbol of purity and royalty. On the fourth day, the deities take a ride on Kalpavriksha Vahana in the morning. Kalpavriksha is a tree that grants boons and satisfies the wishes of the devotees. After Unjal Seva in the night, the deities are carried on Sarvabhoopala Vahana. Fifth day of Brahmotsav is very unique. It is celebrated to commemorate the Lord's incarnation as Mohini. The legend goes that Lord Vishnu assumed the form of Mohini or a beautiful girl to give amrit to the Devatas. 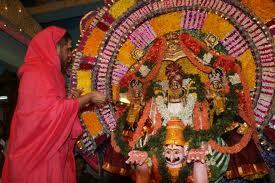 In the night after Unjal Seva, the Lord is carried on Garuda Vahana and decorated with Mahaakanti, Sahasranaramala. According to ancient Hindu texts, Garuda is the king of birds, a replica of the Vedas while Lord Vishnu is the God of Vedas. Thus, the Lord visualizes Himself as Garuda. 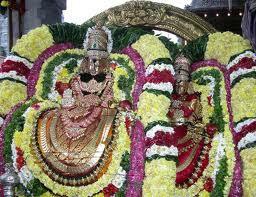 Garuda vahana is the most important and greatest of all the vahanas and many pilgrims visit Tirupati on this day. On the morning of the sixth day the deities are carried on Hanumad Vahana. Hanuman is the guest of this day. The pilgrims feel that they are blessed if they could catch a glimpse of the Lord on Hanumad Vahana. On this day, instead of Unjal Seva, Vasantotsavam or spring festival is celebrated. 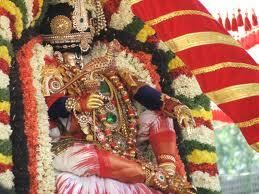 During the night the Lord sits on Gaja Vahana which is a symbol of wealth. It is also attributed to the elephant in Gajendramoksham the story from the Mahabhaghavatam, where the elephant was saved from a crocodile by Lord Vishnu. On this day, the Lord is mounted on Suryaprabha Vahana or the sun chariot. Surya or the sun is the other form of Lord Vishnu. According to Hindu mythology, Lord Vishnu is the center of the universe and to symbolize this Lord Vishnu uses Suryaprabha Vahana. The Lord is taken out on Chandraprabha Vahana at night after Unjal Seva. Devotees believe that it gives the Lord a soothing experience when he travels on Chandraprabha Vahana. On this day the Lord travels on a chariot or ratham. People believe that those who witness this day will not be reborn. The idols of Daruka, the charioteer of Lord Krishna and the four horses are placed before the deities. The devotees pull the chariot chanting Govinda!Govinda! The Lord and his consorts are taken in a Aswa (horse) Vahana after Unjal Seva in the night symbolizing energy and power. Pallaki Seva and Chakrasnana Mahotsavam in the morning and Dhwajavarohanam are performed in the evening on the last day of Brahmotsavam. 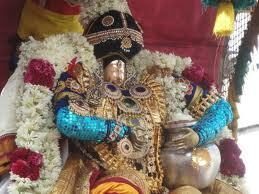 Abhisekham is performed on this day by applying oil and turmeric powder on the idols. The Garuda flag which was hoisted on the first day is lowered on the last day. 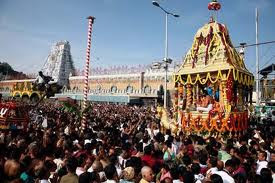 Thousands of devotees every year gather to witness this grand Festival, participate in the rituals, and receive the blessings of Sri Venkateswara swami. The complete 9 day Festival is a memorable experience for all tourists and devotees. The feeling of complete bliss and heavenly connect is often termed as “Vaikunth anubhav”. On the first day of the Festival Garudadhwaja (flag with the emblem of a black garuda) is hoisted near the Srivari Alaya Dhwajasthambham. 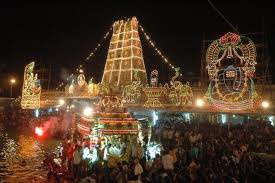 A procession then proceeds of Lord Venkateswara on the Pedda Seshavahana proceeds around four streets of the main temple for two hours until midnight.Ankurarpana and Senadhipati Utsavam are celebrated on the day just before the first day of Brahmotsavam. In the Brahmotsav celebrations, the powerful snake transforms itself as the vehicle for god. The moral behind the prayers that are offered during Garodtsav, is to pray to God for a living with high values and morals.